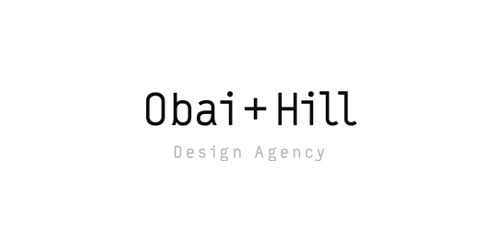 Here at Obai & Hill we are undergoing a rebrand to help us define our vision and direction as we continue to grow. 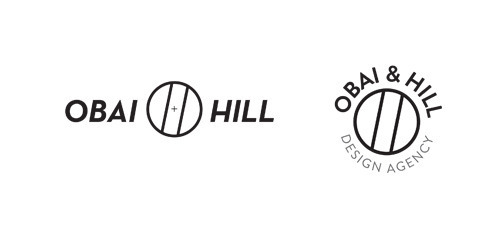 Take a look at some of the initial logo concepts we’ve come up with below! 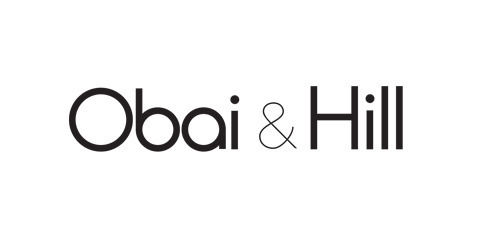 Obai & Hill is looking for a Sales and Marketing Associate to join our team to work on a variety of dynamic projects. 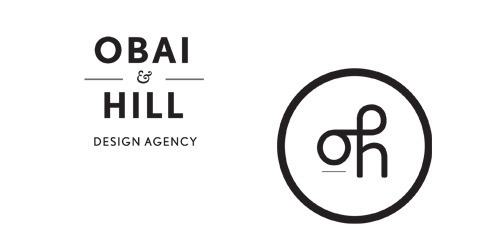 If you are a self-starter, highly motivated individual with experience in sales and/or managing client accounts and utilize your passion for marketing by implementing latest tools, techniques and trends in PR and marketing , then this position could be just for you. As a rockstar sales and marketing guru, your main responsibilities will be twofold. First, to generate and pursue new business opportunities to achieve sales targets, and second to support the marketing team by taking providing clients with bespoke PR and marketing solutions. · Motivated and willing to learn multiple tasks to ensure timely completion of all responsibilities. · Computer literacy: Microsoft applications (Word, Excel and Powerpoint) are a must and Adobe Photoshop would is preferred but necessary. · To generate and pursue new business opportunities and achieve sales target set by the management on monthly basis. This may require travel to potential client offices. · Deliver and maintain monthly reports about sales, customers, product mix to the management team. · Maintain comprehensive knowledge of products and services offering, market intelligence, industry trends and competition. · Coordinate and support the preparation of marketing campaigns to attract local, regional and international awareness and sponsorship. · Coordinate and provide support in the organization and setup of all brand events. · Support the preparation of marketing material and collateral. · Coordinate with contractors/third party agencies and oversee their activities. · Develop and maintain a strong relationship with advertising and marketing agencies locally, regionally and internationally. 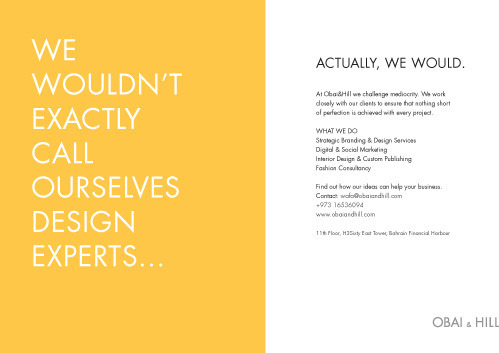 Take a look at our latest advertising campaign! We are offering a fantastic deal for Unido members to help them kick start their business. 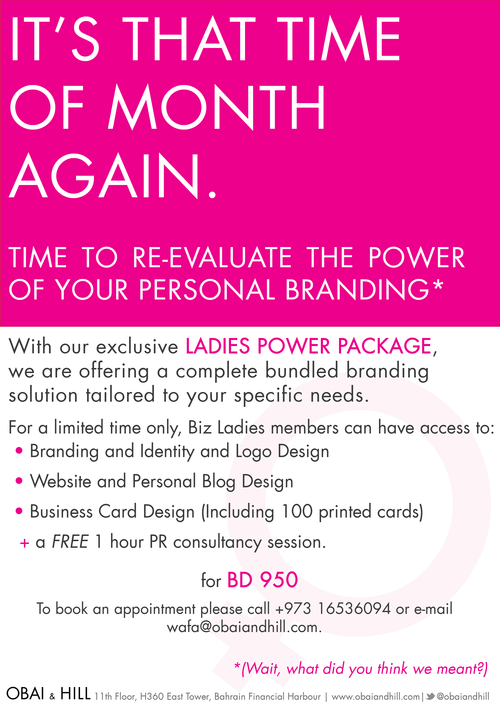 For only BD 895 we include Branding (concept & logo), a website and business card design. 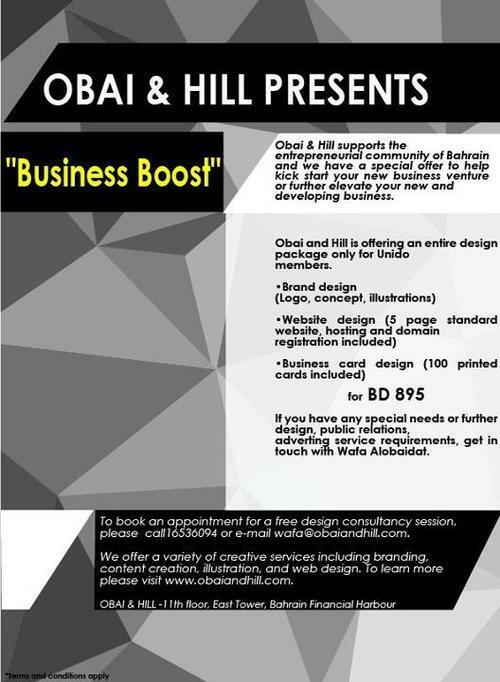 For more information, contact Wafa.